You’ve heard all of the urban legends about how to fix a phone that’s been rendered useless by a dunk in liquid, but real working solutions that won’t void your warranty are few and far between. 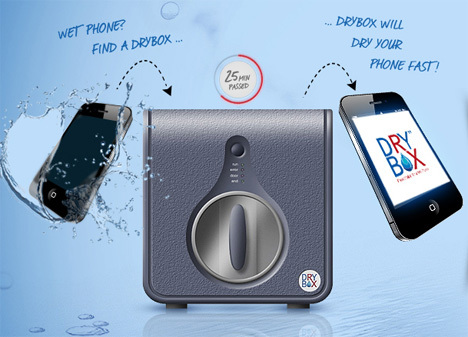 A new device called DryBox is a different kind of fix that will restore your waterlogged phone to working order in less than half an hour. All you do is stick your wet phone in the patent-pending drying chamber and the device purportedly removes moisture at the molecular level. With a claimed 80% success rate and a money-back guarantee if the process doesn’t fix your smartphone, the DryBox seems like a pretty great deal for the butter-fingered phone owner. The machines are currently only located in Austin and San Antonio, Texas, but the brand is looking to expand. We can imagine one of these in every mobile phone store, saving the phones of the chronically clumsy – for a fee.